Cranberry sauce is definitely a food for the sophisticated palate, and what I mean by that is maybe I didn’t like it as a kid but NOW! Now love it! 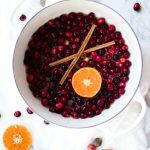 As a dipping sauce for my turkey or spread over a buttery roll either way this cinnamon cranberry sauce is always at my table during the holidays. Why Make Homemade Cranberry Sauce? My mom will NEVER buy canned, always homemade cranberry sauce. And homemade is BOMB! This is just as easy as opening a can, trust me. and healthier. and tastier. You can do it 2 ways. With Orange Juice or Water. Orange Juice version is a little more tart. That’s all. Both are delicious! And if your a novice cook or just not a cook at all and need to contribute to the family dinner, take dibs on the cranberry sauce! I promise you, you will be able to handle it! And you can make it way in advance! Step 1. add all ingredients to a pot and bring it to a boil…. then….this is the best part! Step 2. The berries pop!! Turn the heat down and let it simmer for about 10 minutes. Stir it a few times. Step 3. Let it cool and come to room temperature. It will totally thicken on its own. Dish that baby up or store in an airtight container in the refrigerator until you are ready to serve! PRO-TIP: don’t like chunky cranberry sauce? put it in the blender to create a smoother texture. The starches in from the cranberries naturally give it a jelly/jam like texture. If your a novice cook or just not a cook at all but still need to contribute to the family dinner, take dibs on the cranberry sauce! I promise you, you will be able to handle it! And you can make it way in advance! A deliciously easy recipe for all you cran-lovers. Gotta carry on the tradition. In a small sauce pan, bring water or orange juice to a boil. Add sugar and whisk til dissolved. Mix in ground cinnamon, nutmeg and cinnamon stick. Add cranberries and lower heat and allow to simmer until berries have burst and softened. Stir occasionally, about 10 mins. Remove from heat, sauce will thicken as it cools. I am never going back to canned cranberry sauce, LOVE how easy this is, whoda thunk?? Delicious!!! Would highly recommend this. Tomorrow is our Thanksgiving feast at work. Tastes fabulous! Thanks!